Kenyan coaches like John Anzrah and Catherine Ndereba going without food and having to plead with runners to give them food or allow them to use their badges to eat at the athletes village. Boxes of Uniforms and other equipment that was supplied by sponsors like Nike and meant for the athletes, were stolen by officials. Athletes were forced to move into a shanty after they were kicked out of the athletes village but had no tickets to return home. Meanwhile NOCK officials were pocketing millions of Kenya shillings that was meant for the athletes. Eliud Kipchoge could not find water to rehydrate during the marathon race. All these scandals happened while Kipchoge Keino was NOCK chairman. You would think a man who represented Kenya would be able to at a minimum look out for the welfare of athletes. But instead Keino not only presided over the corruption and incompetence, but he himself was neck deep in the corruption and theft. In fact his daughter in law took pictures of herself in the stolen uniforms and posted them on twitter. The corruption was so brazen that Keino did not even have any qualms about demanding that he be re-elected again. Kenyan athletes succeeded on the track and these officials took credit for it. This despite the fact that they were not involved in any way shape of form in the preparations. Ask any of these guys what training program Eliud Kipchoge did to prepare for the Olympic marathon and they could not tell you. Not even Keino. Tergat is one of the most succesful track athletes of all time in the whole world. He is a five time world cross country champion, two time world half marathon champion. He won numerous city marathons such as the New York marathon and the Berlin Marathon where he set a world record in 2004. His record on the track was excellent. But can he clean up the mess at NOCK? Can he emulate Mike Boit? Mike Boit had an illustrious and long running career which included winning a gold medal at the 1978 commonwealth games and a bronze medal at the 1972 Olympics. But it was when he was appointed Kenya sports commissioner in 1990 that he really made his mark. Before his arrival at KNSC, Kenyan athletes were thoroughly and utterly exploited by officials in charge of athletics. The officials would demand a cut of every penny that an athlete made. If an athlete refused to comply, he would not be allowed to leave the country to go and compete and make money. And this was during an era when opportunities to make money by running were few and far between. The officials would also take a huge cut off any reward money given by politicians to athletes. In some cases, the money disappeared before it even made it into the hands of the athlete. Such was the case of Stephen Muchoki who was given a gift of 34 grade cows by Jomo Kenyatta and never saw any of them because the officials took them. There was also the case of heavyweight boxer James Demosh Omondi who after his performance at the 1984 Olympics in LA, was invited to become a sparring partner for a boxer who was going to challenge for a world title. He was to earn hundreds of US$ per day. At the time Demosh was a soldier. A senior army officer demanded a cut of the money. Demosh baulked and the army refused to give him permission to go. Mike Boit ended these exploitative acts when he became chairman of KNSC in 1990. He ushered in an era where runners could pocket their hard earned financial gains without worrying about officials demanding a cut. Kenyans will be hoping that at a minimum Tergat will stop the corruption, poor organization and theft that bedevils NOCK. Equipment that is donated by sponsors should go to the athletes. The athletes who sacrifice their time and often money to run for their country are the ones who should be getting financial rewards that come from sponsors and not the officials. Money should be well accounted for. Over and above that, Kenyans will be hoping that Tergat can come up with a program to boost the performance of the country in other sports besides athletics. Kenya has become so dependent on athletics that the country cannot win medals in any other sport be it the Olympics, the Commonwealth games or even the All Africa games. Now contrast this with Nigeria which won 11 gold , 11 silver and 14 bronze at the 2014 Commonwealth games from a wide variety of sports like power-lifting, boxing, table-tennis and wrestling. Instead of allowing NOCK officials to pocket millions of shillings from sponsors, the money could be channeled towards developing young athletes who could represent Kenya in the future as well as by hiring could coaches who can teach modern techniques. It will be a tall order for Tergat. NOCK has been rife with corruption and theft for years. 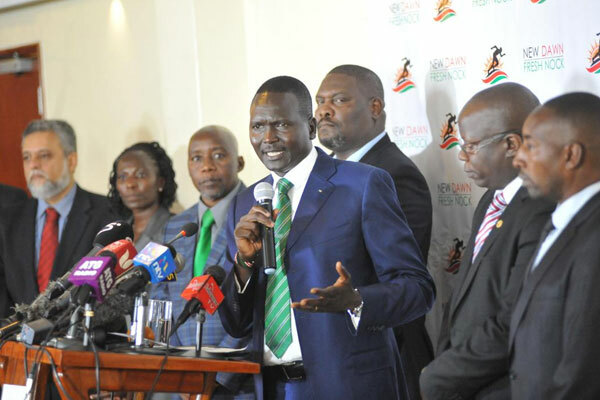 The good news for Tergat is that some of the most corrupt NOCK officials were not re-elected. The list includes Keino, Ben Ekumbo and Stephen arap Soi all of whom were implicated in grand corruption schemes. The bad news some of the bad elements from the past retained their positions. This entry was posted in Kenya Athletics News, Kenya Sports news and commentary and tagged NOCK, Paul Tergat. Bookmark the permalink.